One thing that has really been exciting for me in the last 3 months has been the Salesforce Foundation. When Marc Benioff founded Salesforce he committed 1 percent of stock, 1 percent of employee time and 1 percent of licenses to charity. It’s an incredibly small amount of equity and resources but it has had an amazing impact. Google and others have copied it and it has become a widely used model. I wish I had done the same thing with my most recent startup. I could have benefitted a charity I am passionate about with very little burden to me or my investors. It’s powerful but it is hard to do. Legal structures, convincing co-founders, convincing investors and then there is all the overhead and work of setting up a foundation and managing it. The Upside Foundation is launching to make that easier. They are creating a foundation structure which you give options to which convert on an exit and The Upside Foundation then donates the proceeds to charity. The model is simple and powerful – early-stage companies donate stock options to the Upside Foundation, convertible at exit into a small portion of their equity. 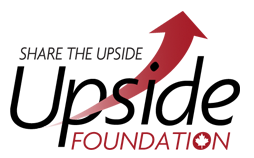 When a liquidity event occurs, the Upside Foundation sells its options and donates the proceeds to charities in Canada. The Upside Foundation board is full of some of the best investors and entreprenurs in Canada, including Rob Antoniades (ON), Mark Skapinker (ON), Mark Macleod (PQ), Gerry Pond (NB) and Ben Zifkin (ON). I’m excited. Let’s start giving back while we build amazing companies right here in Canada. Thanks for sharing this. I am really excited to be part of this project. I think that our industry can have a massive collective impact by contributing a small amout of our equity.